This wide-ranging and much-honored documentary explores Puerto Rico’s rich cultural traditions and untold history, revealing the remarkable stories of its revolutionaries and abolitionists, poets and patriots — all of whose struggles for national identity unfold within the complex web of relations between Puerto Rico and the United States. The film moves fluidly between Puerto Rico itself and New York’s South Bronx barrio. By illuminating the past, examining the present, and bringing Puerto Rico’s vibrant cultural heritage to audiences, the film illustrates why the political fate of this tiny Caribbean island concerns all Americans. The style of the film is personal, intimate, and accessible to all students, with producer/writer Raquel Ortiz serving as on-screen host and narrator. Her participation in the process of learning about her own heritage infuses the film with an engaging dynamic of discovery and interaction. Traditional Puerto Rican music — including storytelling plenas — punctuates the film, while noted Puerto Rican artist Juan Sanchez’s collages — composed of striking graphics, images from the past, and symbols from popular culture — provide an innovative method of presenting history, as visual elements from the collages are “assembled” and “disassembled” on screen. To facilitate educational use, “Mi Puerto Rico” is well-edited into 15-minute segments. It is essential viewing for many classes in Latin American studies, American history and studies, multiculturalism, and Caribbean studies. 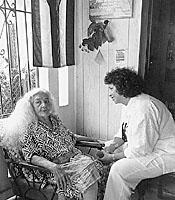 “Mi Puerto Rico” was directed by Sharon Simon and produced by Raquel Ortiz and Sharon Simon.